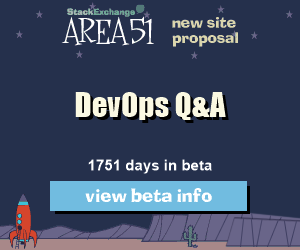 But in the interim (and frankly I don't know that we need a separate Stack Exchange site for DevOps), what is the guidance on the topicality of DevOps questions on Stack Overflow (or Server Fault for that matter, although this is not meta.SF)? Are questions related to operational concerns, but enabling development activities, on topic (for example, relating to technologies like Docker, CI/CD pipelines, etc.)? I closed that question, so perhaps I should weigh in here. First, there's the term "DevOps". This, as I understand it from reading The Phoenix Project and paying attention to Gene Kim et al., is breaking down the artificial barriers between development and operations, and having them work closely together throughout the lifecycle of a project/product. Wherever possible this is to be commended and encouraged. There's a second, much darker definition of "DevOps", which has very little to do with this. In this parallel universe, Ops is dispensed with altogether, and replaced with Dev. In other words, Dev does Ops. Unfortunately, since Dev and Ops require different skillsets without much overlap between them, a fact not widely recognized either by developers or management, this doesn't usually work out very well. It generally only seems to work when Dev outsources Ops, e.g. to AWS, Heroku, OpenShift, or some other public IT service, though this activity is closer to the first definition than the second. While DevOps (done right) does blur the lines somewhat between Dev and Ops, there is still almost always a boundary where on one side is "operations" tasks, such as provisioning bare metal, backing up servers, configuration management, and so on, and on the other side is "development" tasks, such as configuring Jenkins to build a project automatically from a source code repository. In the middle are tasks which aren't obviously on one side or the other, such as installing Jenkins and configuring the web server in front of it (which may be optional), setting up git, and so on. In some houses Dev does these tasks, while in others Ops does them. In these cases I try to give the benefit of the doubt. With regard to this specific question, it asked for best practices for setting up a development environment for running Docker containers. That it was posted on Server Fault at all is surprising; it's obviously off topic there, much as a question about best practices for setting up Visual Studio would be. Should SO accept questions about development tools and environments? If it is not already doing so, as specified in its own topic list, then it should be. The specific question closed here is almost certainly too broad or opinion-based for SO, but might be suitable for Programmers (possibly after some editing). But in general, questions about setting up development workstations and environments should not be sent to Server Fault unless they are very obviously Ops tasks. The OP is doing stuff as a developer on their laptop, that makes it not topical for Server Fault. For reason's unknown this part of the same page on StackOverflow is ignored, or determined to not include FOSS tool. In this, and many other cases, the tools are being used for software development, they are no different than any other software development tools. Questions regarding them in these circumstances should have a home on StackOverflow. Does the tag [devops] really fill any gap between author and questions?